The Williams' bon chretien pear, commonly called the Williams pear, or Bartlett pear in the U.S. and Canada, is the most commonly grown variety of pear in most countries outside Asia. It is a summer pear, not as tolerant of cold as some varieties. It is often eaten raw, but holds its shape well when baked, and is a common choice for canned or other processed pear uses. In 1799 James Carter imported several Williams trees into the United States, and they were planted on the grounds of Thomas Brewer in Roxbury, Massachusetts. The Massachusetts estate was later acquired by Enoch Bartlett of Dorchester, Massachusetts. 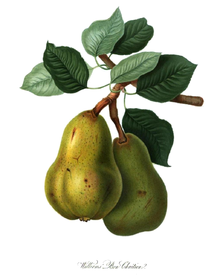 Unaware of their origin, Bartlett named the pears after himself and introduced the variety into the United States. It was not realized that Bartlett and Williams Pears were the same until 1828, when new trees arrived from Europe. By that time the Bartlett variety had become vastly popular in the United States, and they are still generally known as Bartlett pears in the U.S. and Canada, although there are about 150 other names worldwide. Pear trees are typically in production for an average of 50 to 75 years, although some trees still produce fruit after 100 years. Height: 15–20 ft with slightly less spread. Flowers: White flowers grouped in a corymb. Blooming Time: April - May. Fruit & Seeds: Large, golden yellow skin, brownish red blush, classic shape with smooth, white flesh. Harvest from mid-August to mid-September. But depends on which side of the earths hemisphere the plant has been placed for harvest time. Leaves: The leaves are simple, glossy green leaves that alternate on the twig. They grow up to 3" long, are thick with slight midrib curves folding the edges inwards. They have fine teeth on the margin. Elevation: 1000 - 5000 Feet. In 1985, the pear represented 80% of U.S. pear production, and in 2004, it represented 50% of reported pear production, displaced primarily by the continuing growth of d'Anjou and Bosc pears, both winter pears more tolerant of cold than the Bartlett. While more pears are sold fresh in the U.S. than processed, Bartlett pears are the primary choice for canned halves, puree, and most pear juice and nectar in the U.S., comprising about two thirds of Bartlett production. Bartletts are traditionally known as the canning pear due to their "definitive flavor and sweetness," making them well-suited for many forms of processing. The Williams pear is used in making Poire Williams, a colourless brandy. ↑ 1.0 1.1 1.2 1.3 1.4 USA Pears. (2008). . (website). Yellow Bartlett Pears. ↑ 3.0 3.1 Delange.(2007). . (website). Bartlett Pear.